G-mom and G-dad are having a wonderful time visiting kids and grand kids living in the Eastern half of the country. So far we’ve been to Augusta, Georgia to be with Gene, Winona, and grand kids Asher, Kate, and 2-month old Emma. Dr. Gene had to stay in Augusta to look after his patients while the rest of us drove to Yorktown, Virginia, to visit, Lt. Col. James, Ann, and the grand sons John and Andrew. They too will soon have a new baby brother or sister. What a joy it is for the ‘cousins’ to spend time together and get to better know each other as they grow into school age. It’s been hot in Virginia so swimming in the Residents Pool has been a lot of fun and a welcomed relief from the heat. 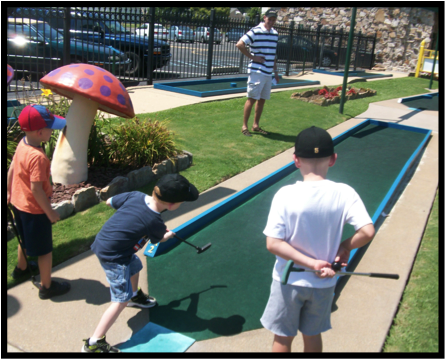 The boys even got away for an afternoon of golf, the miniature version, followed by ice cream. In this photo Asher tees off as others watch. John, on the right, won the match, and Andrew, on the left had a hole-in-one as did Asher. Another way to beat the afternoon heat is to play with the iPads. 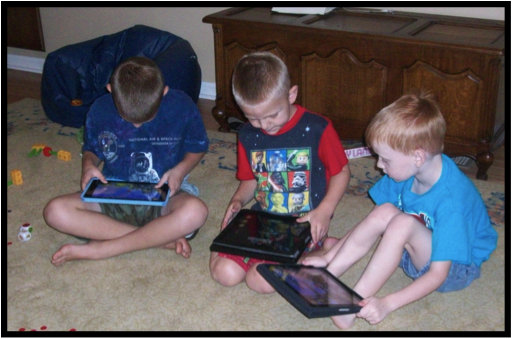 Every family has at least one iPad so the boys can all play at the same time. John, the oldest, starts second grade next year as Andrew (in the middle) and Asher attend Kindergarten. Kids are at ease with these techno-tools and I want them to play games that have strong problem-solving elements. Such games help kids develop the problem-solving skills (perseverance for example) that are not dependent upon school content. The boys like to play Star Wars Pit Droids (see The Return of the Star Wars Pit Droids post - February 2012) and are well into the second level where the problems are much more challenging. Of course playing the game along with the boys gives me the chance to help them think through the difficult sections. This photo show a level two problem that requires directing pit droids of different colors (color is just one of many attributes a pit droid can have). Kids like the physics-based puzzle games so I tried to download the classic The Incredible Machine to the iPads but it is no longer in the APP store! I have it on my iPad so the kids had to take turns playing the game. 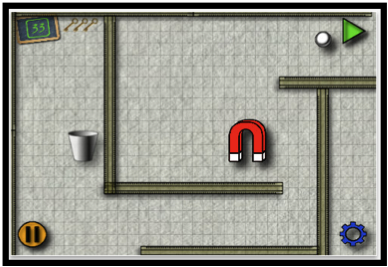 I also have Casey's Contraptions, a game similar to The Incredible Machine loaded in my iPad but it also is no longer available in the APP store. I did find the game Crazy School in the APP store for $0.99. It’s not as extensive as the other two games but I did download the game to all of the iPads. Here’s a sample problem screen. The tools available to solve the problem are in a tray off-screen to the right. All problem-solving and no play is not the way to go so I downloaded the iPad version of SolarRola, a platformer (Donkey Kong style) game from the big-time game publisher Square Enix. Here’s a sample screen from the game. 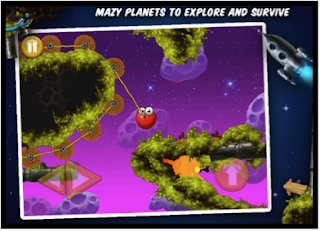 The graphics are great, the animation smooth, and the gameplay allows for either tilt-screen or key control. 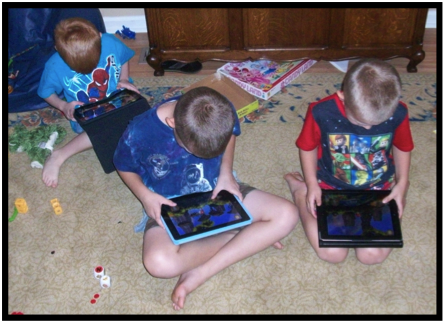 As focused as the boys seem to be in this photo, within 30 minutes they had moved from iPads to other forms of more active play. Like chasing each other through the hallways and up and down the stairs of a two-story house. When we return to our home we are expecting to have a visit from Joshua and Jordann, our two oldest grand kids. 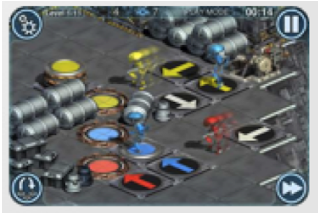 Wow I am excited to see Pit Droids as an App on the iPad! Going to download it soon and use it to put my mind other uses than research. Thanks Jim! Glad you found Pit Droids! I had the opportunity to consult with the design team on that project. I even got my name in the Credits! Dad, what a great post and the kids had a blast playing with you and g-mom. You always have fun and new things for them to do. Asher has already asked where we get plane tickets to go to Cali.